Ah, I agree with Jeanne. In fact, yesterday I panicked when I couldn't find this little pitcher that I keep in the laundry room to fill the iron with. It is in the shape of a revolutionary soldier with a tri-cornered hat. It is nothing I would ever pick out for myself but it came from an elderly friend, who lived in my grandmother's house and who gave it to me right before she moved out after my grandmother passed away. It's a little piece of my history. "It is my old Hermes scarf, my favorite that has travelled with me all over the world" and "The Mistral carries a different tune but flaps my scarf with the same song", "my hand reaches up instinctively again to be sure…" are the poetic renderings of "my quiet life." It could not be a quiet life. Is it? And " it is a carré, not a foulard". I love that fine touch. And it was there in the mountain and the royal pair. Indeed, so nice to have the appreciation of the spectacular Hermes and also the simple things in life..
What a beautiful post about a special treasure. . .memories. Happy lump in my throat. And I forget sometimes that fine writers read the actual writing for writing. Judith does too. It makes me mighty happy when it pleases and I don't take for granted your encouragement, Bright Star one you. I think you have mentioned this scarf before!What a friend and accessory it has become!Really only 50 Euro's...........what a buy. I decided about a year or two ago I would like one, but until now nothing!I haunt the consignment shops but none of what they have speaks to me!I want flowers...........roses I think!Hard to find when you have your mind set on something!I am in no need of scarves...........so maybe thats why!!! That was just so beautiful that I got shivers down my spines. Like you, that scarf has had some adventures. I hope that you will both have many more. Oh thank you Loree, I am so grateful for that. Once you start traveling you have the bug! Leslie, oh thank you for this so much. Remi saw your comment before I did and told me about it! :) And actually, I have written a tiny bit about our adventures but somehow let it go. If you type "Past Adventures" in the search option, they should arrive. But you are oh so right, I did these things and even if they seem far from my current life they deserve to be shared. Merci. Truly. A very wonderful piece of writing and living. Merci Joan. You too have many tales to tell...? We have an old butter dish, made from recycled green beer bottle glass during the Great Depression, which one of my sisters-in-law gave to me. As she handed it to me, she said "It has a chip in it, and I know that won't bother you one iota, but it means we can't sell it in the shop, because other people don't see the beauty in it if it has a chip." We use it everyday - it sits on the kitchen counter and gets a lot of love (we like butter!). And she was quite right, I love it even more because it has a chip in it…just like people, it's the flaws that makes us interesting. Your scarf is absolutely beautiful, and I can understand how it means so much more, with all the memories, than just a bolt of silk. My dear friend, I knew that you more than anyone would understand this post. Gros Bisous to you and your gorgeous family. Even your scarf has a patina :); a very beautiful one. It's not the scarf or his value, I guess, it's all your memories they have settled in over many years .Weeks ago you wrote about parfume. Isn't it similar? A certain scent bring back a certain moment. As long you can feel these you are alive. Mumbai, your responses always blast me! I loved this so very much. It is so true and so perfect. Oh,I kid you not......unfortunately, the very wealthy, German mother of a friend of mine (we'd all liked the lady during her many visits to America over the years) died this past Winter. 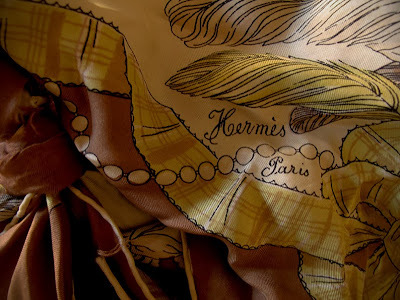 The daughter (who's about my age & has lived in the USA for at least twenty years) came back from her visit to close down the German house bearing, among other items, somewhere around fifty Hermes scarves. Most of them were still in their original packaging...never worn....and they'd all been bought in Europe (France or Germany, I don't know) over the past forty years. From what I gathered my friend's mother wasn't particularly FOND of scarves, but Hermes scarves and jewelry were what her industrialist husband gave her for every holiday/special occasion over a very long marriage. My friend brought all of these scarves over to the house of two other, longtime friends (both female...mother and daughter) who indeed DO love scarves, but could scarcely afford even one Hermes scarf.......and then the riches started flowing as my German friend anounced "You'll actually wear them.....take as many as you want...just pick the ones you want..". Many Many Squeals.....many repeated declarations of :"Oh, I can't; I already took five! (invariably followed by a roll of German eyes and the declaration "Why NOT?..just have as Many as You WANT! They look GOOD on you!!!"). It was a very, very happy afternoon in that old house. I think my American friends wound up with about 15 ultra-luxurious scarves apiece. both happily remarked that they'd never have to choose or change outfits again; they'd simply change scarves every day. Such a gorgeous story, David. Thank you for the reminder of the goodness for goodness sake(s) that still exists...That afternoon sounds like dry champagne. I love this post - even the title is melodic. I love how you bring out the music in words. I love this!! You are such a charming writer...you really capture and articulate those lost thoughts that float through the mind. Bravo! Heather, your post made me smile. I thought about all of my exciting (some would say crazy) adventures around the world - camping in the desert in Tunisia after battling a dust storm; traveling along the Nile in a felucca; hiking in Romania; spending a week in a hut in the Amazon River Basin in Ecuador and fishing for piranha; traveling in an armed convoy through Yemen's dangerous Marib province and exploring Egypt's Valley of the Kings on donkey, just to name a few. But never, never would I be so brave as to take with me one of my much loved and treasured Hermes silk scarves in my ever-growing collection. Not when they're more than 400 bucks a pop! They're safely stacked on top of one another on an upholstered shelf in my walk-in closet, waiting for me to select one of them, as I do at least three times a week, and wrap one around my neck. No, I'll leave the traveling the far corners of the world with a beautiful silk up to you. My beaten up hiking boots are my traveling partner. And they have some stories to tell! Oh I loved this! We are up in the Luberon and only have internet upon occasion but I will look forward to finding out more of your adventures when we get back next week for you are clearly a woman after my own heart! And yes...the boots...mine are a pair of men's tod's (bought second hand and in my size) that I have worn out...nearly...but not yet! 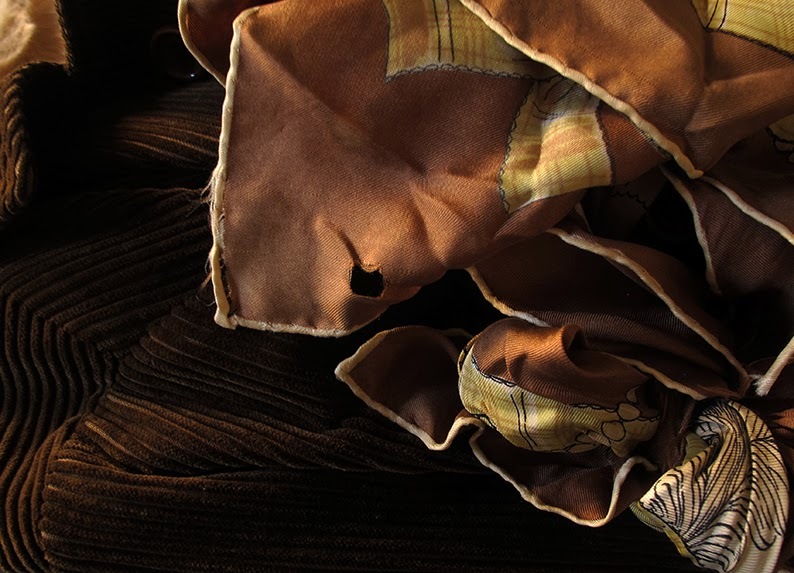 Why are my Hermes scarves neatly folded in a drawer? You've inspired me to take these "precious" gifts and wrap myself up in their elegance and warmth and beauty and just enjoy! Thank you so much.